A sauce made with tomatoes, extra virgin olive oil (4%) and basil. 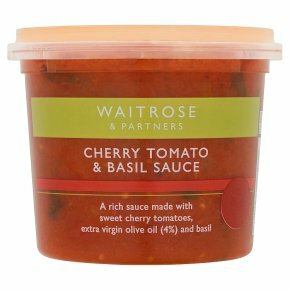 INGREDIENTS: tomato, cherry tomato (24%), tomato juice, water, onion, extra virgin olive oil (4%), sun dried tomato, basil (2%), sunflower oil, tomato purée, garlic purée, sugar, salt, wine vinegar, grape must concentrate, grape must, sea salt, oregano, garlic powder. Time: 3 - 4 mins. CHILLED. MEDIUM HEAT. Empty contents into a pan. …Heat gently, stirring occasionally, until piping hot. Stir before serving. Do not reheat once cooled.